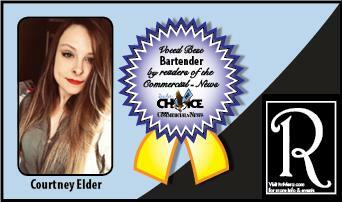 THREE RIVERS ― Readers of the Three Rivers Commercial-News chose Courtney Elder as the 2019 Best Bartender with a Readers Choice Award. Elder’s ability to connect with people with a listening ear makes customers feel welcomed at the Riviera. She said her signature drinks, and her favorite ones to make, are the Purple Haze Martini, which features a blackberry/raspberry flavor, and the classic Moscow Mule. “I love, love, love it here. It is such a great group of people and it never really feels like I’m working when I’m here. Even when I’m serving drinks, it always feels like I am just hanging our with my friends, with the people I only see once a week, and the people that I just love to be around,” she said. Elder gets to know her customers, either through casual conversations about their day or by getting together regular customers’ drink order before they sit down. “Nancy and Bob are a perfect example. They come in every Friday and they usually get a Cabernet, and tend to eat popcorn, so I always have their table set up for them. I chat with them to ask them how their day is to make them comfortable to be here,” she said.